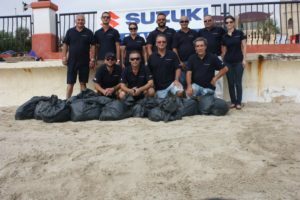 Now in its fifth year the Suzuki Clean up the World Campaign, saw employees of Strand Marine & Autosystems Limited, team up to carry out a beach cleaning exercise at St. George’s Bay in Birzebbugia last Saturday. “Whilst efforts from authorities to keep beaches clean is ongoing, the amount of waste that people discard is shocking. The importance of keeping our marine environment healthy is very much our concern and we are proud to be supporting this global effort from all Suzuki Marine dealers worldwide”, said Matthew Travers Tauss, Director, Strand Marine & Auto Systems, agents of Suzuki Marine in Malta. A team building effort by employees of Strand Marine & Autosystems Limited saw them carry out a beach cleanup exercise at St. George’s Bay in Birzebbugia. The clean-up exercise was part of a world-wide Suzuki Cleanup the World Campaign set up by Suzuki Marine dealers and was carried out in all countries which market Suzuki outboard engines. The main objective of this campaign was to create awareness on environment protection while maintaining a safe and clean environment. This campaign kicked off in 2010. “We are proud to be part of the global effort from all Suzuki Marine dealers to give back to the marine environment”, said Matthew Travers Tauss, Director, Strand Marine & Auto Systems, agents of Suzuki Marine in Malta. “Apart from showing our concern towards the environment this event also proved to be a great exercise in team building”. Strand Marine also announced that all fees related to labour costs on the two days were to be donated to Puttinu Cares. “Corporate Social Responsibility has always been considered an integral part of our operations. This year we felt that we should give a contribution to Puttinu Cares, whose team works tirelessly, and at great financial cost, to provide a holistic approach of care for families with children suffering from cancer, “ explained Matthew Travers Tauss, Operations Director, Strand Marine & Autosystems. “We are pleased to be able to offer a contribution towards such noble efforts”. 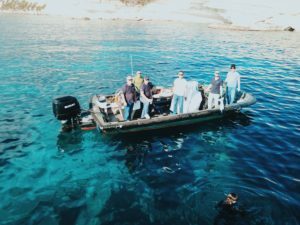 The Seabin Project | Malta is the brainchild of local marine agents Strand Marine and eNGO Żibel who have partnered up to bring the award winning Seabin to Malta. This initiative is part of their efforts to provide a holistic solution to combat marine waste and the hazards that such waste pose to marine eco systems. The Seabin can catch an estimated 1.5 Kgs of floating debris per day (depending on weather and debris volumes) including microplastics up to 2 mm small. 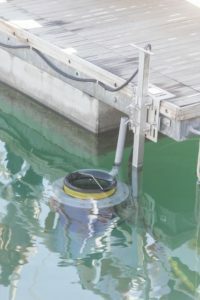 Water is sucked in from the surface and passes through a catch bag inside the Seabin, with a submersible water pump capable of displacing 25.000 Lph (liters per hour), plugged directly into 110/220 V outlet. The water is then pumped back into the marina leaving litter and debris trapped in the catch bag. The catch bag can hold up to 20 Kgs of debris and it is advised to be checked twice a day and emptied as needed. The Seabin needs to be cleaned at least once per month and to be checked regularly. HOW MUCH DOES THE SEABIN COST?